Since BHP Billiton put Latin America on the map with what is now the world’s largest copper-producing mine Escondida, the region has become one of the most favourable locations in the world for copper developments. SolGold (AIM:SOLG) is hoping to replicate that kind of success with the Cascabel project, a tier-1 copper-gold discovery in Northern Ecuador, sitting on the Andean copper belt. With many factors in its favour: endorsements from tier-1 miners, a friendly regulatory and fiscal environment, a highly-experienced project team and its location on the belt that produces 48% of the world’s copper, SolGold is poised to develop an industry-significant project in the near future. Under the stewardship of the vastly experienced CEO Nicholas Mather, SolGold has made significant progress in advancing Cascabel. SolGold has spent US$35 million on airborne magnetics, 3D surveying, soil gridding, rock sampling, geological and structural mapping and 3D modelling – in doing so it has defined 14 targets with seven refined to drill-ready status. It also commenced a full drill programme at one target, Apala, which has returned positive results. SolGold undertook a 23,700 metre drilling programme at Alpala for 18 holes and the highlights were six holes which returned ‘world class’ intersections, over 1km of continuous mineralisation over 1% copper equivalent (CuEq). “Drill hole CSD-14-009 for example, returned one of the best results in the history of mineral exploration, with 1088, grading 0.66% copper and 0.89g/t gold for 1.48% copper equivalent,” SolGold says. A recent company announcement on three drill holes at different targets extended the Alpala strike by another 200m. Hole 21, at the Hematite Hill target, extends the Alpala deposit to the Southeast and will test up to 2,300m depth targeting the longest encountered vertical extent of copper mineralisation at Alpala to date. “Hole 21 is a major step out for SolGold. It extends the exciting Alpala deposit by at least 200m to the southeast, underneath the strongly altered advanced argillic cap over Alpala Southeast,” remarks Mather. Alpala is quickly being realised as what could form the basis of a globally significant copper project. With the addition of another 14 identified targets of potentially equal quality, there is great scope to see just how big Cascabel could be. Now, with a solid capital position of $44 million in the bank, SolGold is pressing ahead with further drilling to expand Alpala and test the other copper-gold targets. The next two years will be crucial as the company plans to drill 95,000m using up to 10 on-site drill rigs. Moran and Aguinaga targets alone provide the Cascabel system the potential to contain 10 billion tonnes of mineralised rock. Using established orebodies as the benchmark SolGoldsays the geophysical modelling along the Alpala-Moran trend is revealing ‘stunning similarities’ to the Hugo Dummet orebody at Rio Tinto’s Oyu Tolgoi mine in Mongolia. The Alpala deposit is said to have near identical geology, mineralisation style and geometry to Newcrest’s Golpu deposit in PNG and Aguinaga has been likened to the Chuquicamata cluster by geologists from a ‘number of the world’s largest mining houses’. While Escondida is located at altitude in in Chile, in a dry and clear landscape, Cascabel sits in the thick Ecuadorian jungle. SolGold has unlocked the potential of the area thanks to being able to ‘see through’ the jungle and heavy cloud cover using state of the art geophysical techniques. The company adds that Ecuador is a friendly environment for foreign mining companies. The country is politically stable with a pro-mining president. The economy has leant on the revenues from major oil projects, but that is now falling and SolGold says it is the perfect time for the mining industry to pick up that slack. There has also been wide ranging improvements to the regulatory framework for miners too, recent tax and legal reforms have been geared towards incentivising foreign miners building projects in the country. Looking at the project through the lens of potential production, Cascabel is blessed with strong localised infrastructure. There is a skilled local workforce, easily available access to power through a nearby hydro station, a high quality road network, accessible water and it is located 180km form the deep water ports at Esmeraldas. SolGold has partnered with the local community and the provincial government to build a new access road between local villages, via Alapala which will allow faster access, improved safety, more drill rigs on site and more freights in and out of the site. As a reflection of the strength of the project SolGold has attracted endorsements from tier-1 miners through stakes in the company. Guyana Goldfields owns a 7.22% interest, CEO & president Scott Caldwell has been placed on the SolGold board and the partnership is expected to add considerable technical and mine-building expertise. Newcrest Mining also owns 10% of SolGold and will provide valuable technical advice as Cascabel is advanced. In terms of looking at Cascabel becoming a producing mine, SolGold is keeping both all options on the table. It has identified the possibility of developing an open cut mine in conjunction with an underground operation. With open cuts towards Ahuinaga and Alapala, Trivinio and Moran targeted for underground mining. Looking forward the market indicators for copper are very positive. 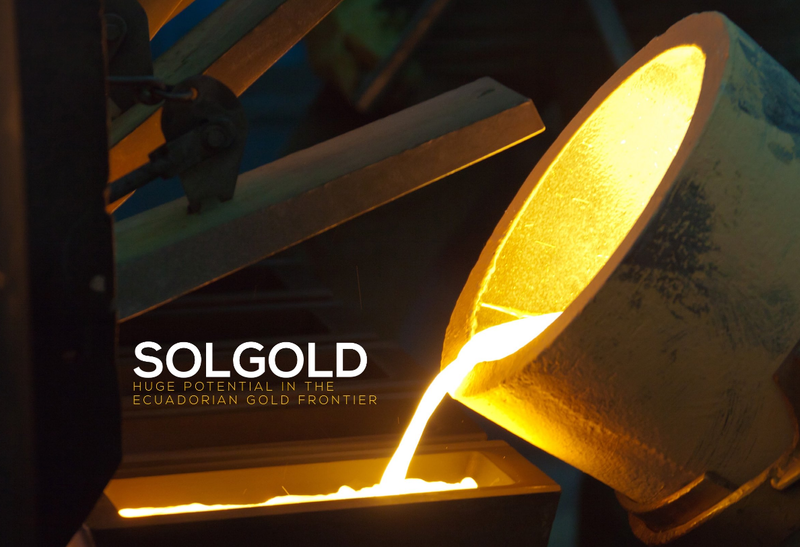 SolGold says, “Global urbanisation is irrevocably driving copper demand skyward.” In addition copper’s use in wiring, particularly for electric vehicles and green energy solutions, will continue to drive up demand as the world’s automotive and energy industries focus on creating electricity-based products. So with SolGold’s plan to drill a further 95,000m over the next two years, extend the Alpala deposit and drill new targets as it understand the extent of the Cascabel project, coupled with an increasing copper price the company is in an excellent position to hit the market at the right time with a monster of a copper project.